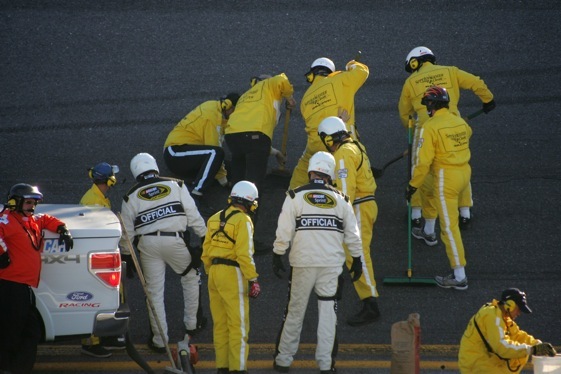 Daytona Beach, Fla. – Robin Braig, president of Daytona International Speedway, has no immediate explanation for the pothole on the track that caused two long interruptions of Sunday’s Daytona 500. “As we do for every event, we inspected the track this morning and there were no concerns,’’ Braig said in a prepared statement. “We are always prepared for these types of issues. We had the proper materials and worked diligently to repair it. The pothole, initially about 9 inches by 15 inches and 2 inches deep, was at the bottom of the banked oval in the second turn, at the edge of the racing groove. The front end of several cars sustained damage from running through the pothole before the race was halted the first time for 1 hour and 40 minutes. The material used for the first repair did not bond and was torn up by the race cars after 35 laps. That necessitated a second delay of 44 minutes as another material was used to fill the hole. The track, which has not been repaved since 1978, is scheduled to undergo a $20 million resurfacing in 2012. Some fans were angry about the delay and complained that the resurfacing should have been done several years ago. Dale Earnhardt Jr., who finished second to winner Jamie McMurray, said he didn’t believe the pothole or the delays changed the outcome of the race. “A couple of guys got some holes in the front of their car. That change the outcome of their day. As far as the finish, (it) didn’t have nothing to do with it,’’ Junior said. Lynda Petty is being treated at the Preston Robert Tisch Brain Tumor Center at Duke University Medical Center. She was diagnosed with lymphoma about six weeks ago. COMPETITIVE DAY: Despite the interruptions to repair the pothole, the racing Sunday was some of the best ever at Daytona. There were 52 lead changes among a record 21 drivers, led by 2008 Daytona winner Kevin Harvick with 41. But Harvick, who was leading at the start of the second and final two-lap overtime, wound up a disappointing seventh in the last-lap melee.